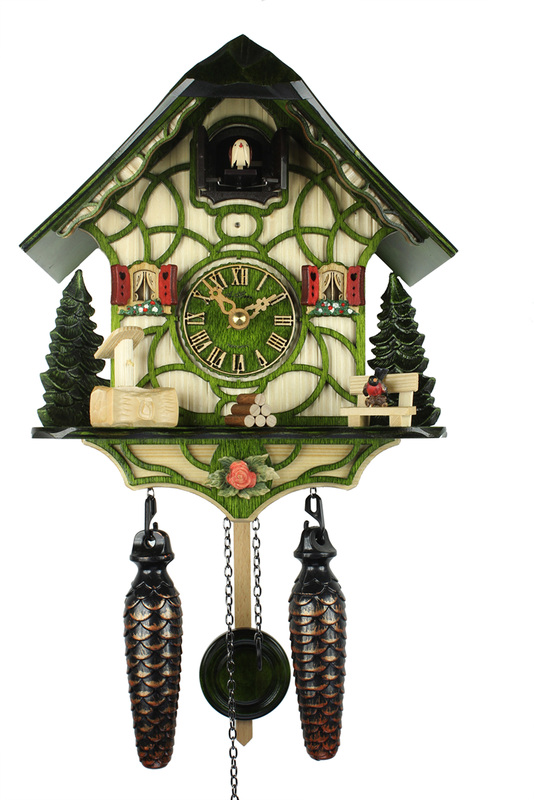 A cuckoo clock with a typical Black Forest half-timbered house in a green colour. It has a hand carved roof, fir trees and a water trough. The cuckoo calls on the hour and is followed by an echo and by one of 12 alternating melodies. A light sensor automatically turns off the cuckoo sound and the music at night, or they can be turned off anytime by means of a manual switch. The clock is personally signed at the back by the manufacturer Adolf Herr. His signature guarantees the experience of 6 generations of clock-workmanship. This clock comes with a certificate of authenticity (AHC). Battery operated movment with manual and automatic night-off (Sensor). Twelve different melodies: Cuckoo Waltz, Bayrischer Ländler, Waterwheel in the Black Forest, The Woodchopper March, Happy Wanderer, Trink Brüderlein Trink, In München steht ein Hofbräuhaus, For Elise, Lorelei, Home Sweet Home, Clementine, Salut d’amour.